We developed Strider's linkage while attempting to create a 4-bar linkage capable of walking on rugged terrain. We failed in that effort, so instead we experimented with pairing two 4-bar linkages into a combined 10-bar linkage with front and back legs, such that the rear leg lifted the front foot and vice versa. 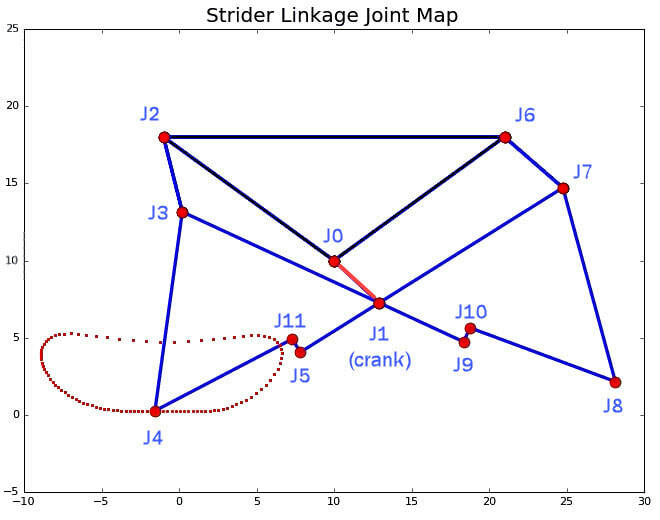 For some highlights of how we benefited from Professor Joseph Shigley's Army feasibility study of walking tanks while developing Strider's linkage, see this post. The more bars a linkage has, the more joints it needs. Each joint adds friction. Furthermore, the joints will always have some play, which can cause long legs with many joints to bend sideways when supporting heavy loads, especially when turning them tank-style. 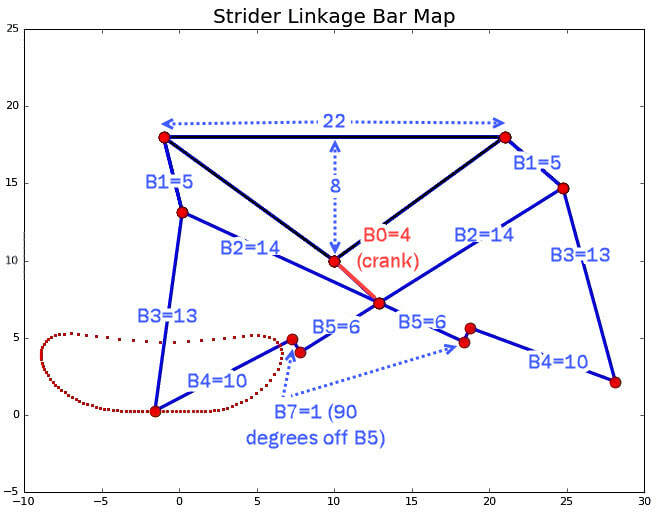 As shown below, Strider's paired-leg linkage has 10 bars, or only 5 bars per leg, versus TrotBot's and Strandbeest's 8 bars/leg, and Klann's 6 bars/leg. 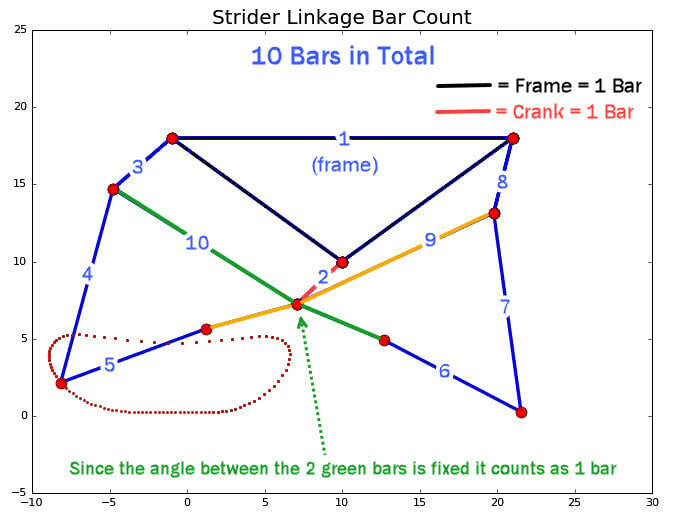 If implemented well, this implies that Strider's linkage has the potential to be relatively energy efficient and should be able to handle loads relatively well. ​Below are the joint and bar maps used in Strider's Python code, which you can download here. Strider's gait can be smoothed by adding toes, which smooth the transition between feet. The length of the below simulated toe is 2 units, angled at 125.5 degrees relative to the leg's inner bar, just like the toes built in LEGO above. ​Strider's gait can be further smoothed by adding shock-absorbing pads to the bottom of the feet, which is explored in this shock-absorbing feet blog post. Below is a simulation of a non-LEGO version using the bar lengths to the right, which has a slightly smoother gait. The dimensions of the simulated toes are the same as the LEGO version's toes above. Note: if you're considering 3D-printing Strider, make sure your parts allow you to manage Strider's Dead Point so that its knee joint doesn't "flip" - you can find some ideas for doing so here. Also, you may gain some insights into how you want to design your robot if you first experiment with some LEGO versions, where modifying prototypes can be faster and cheaper. 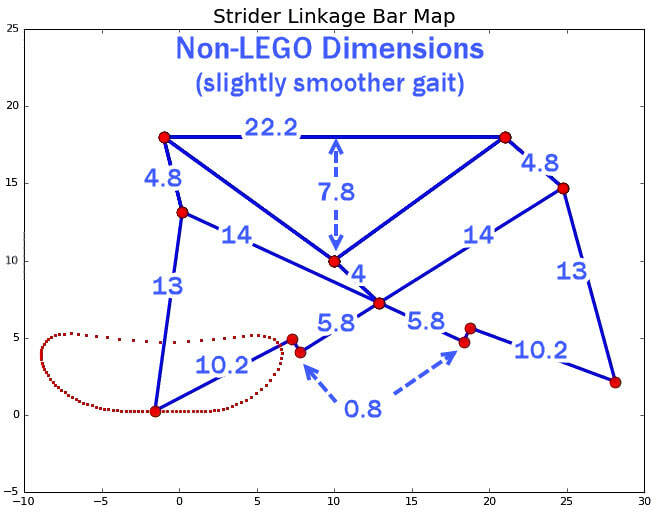 ​If you wish to create a customized version of Strider's linkage, you can find an embedded simulator on Strider's linkage optimizer page, along with some analysis of other LEGO-friendly configurations of Strider. 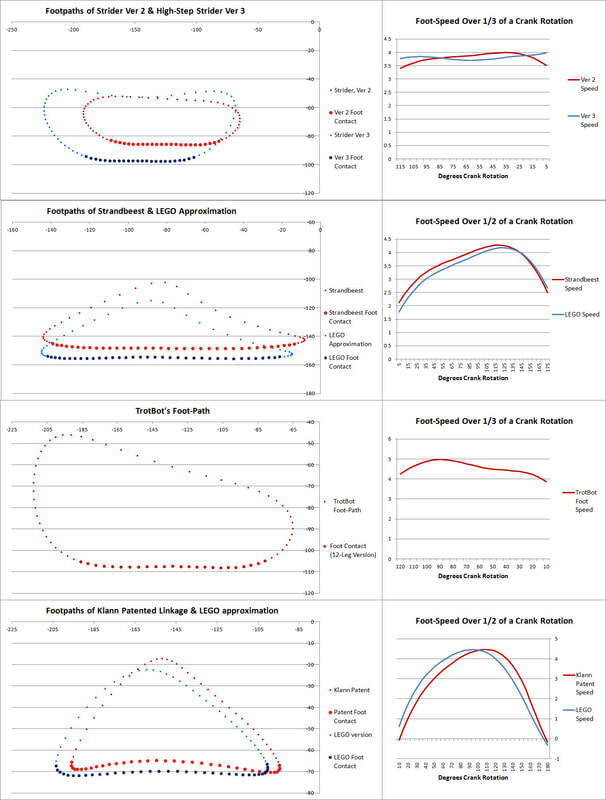 Below highlights Strider Ver 3's foot-contact with the ground and foot-speed when built in a 12-leg version. Without adding feet, Strider has the most consistent speed of Strandbeest, Klann, and TrotBot. Below tests Strider Ver 3's ability to carry loads, using a lower gear ratio of 5:1. To handle the torque, the LEGO plastic axles for the 4 inner pairs of legs were replaced with steel axles before the test, which also results in a less jerky gait since they don't twist and then suddenly untwist like the plastic axles do, which is more noticeable with wider, 12-leg walkers. Below tests Ver 3 on a steep slope using LEGO's faster medium motors, geared down by 5:1. The zig-zag surface of air filters can trip walkers, but they also provide small "steps" for climbing. 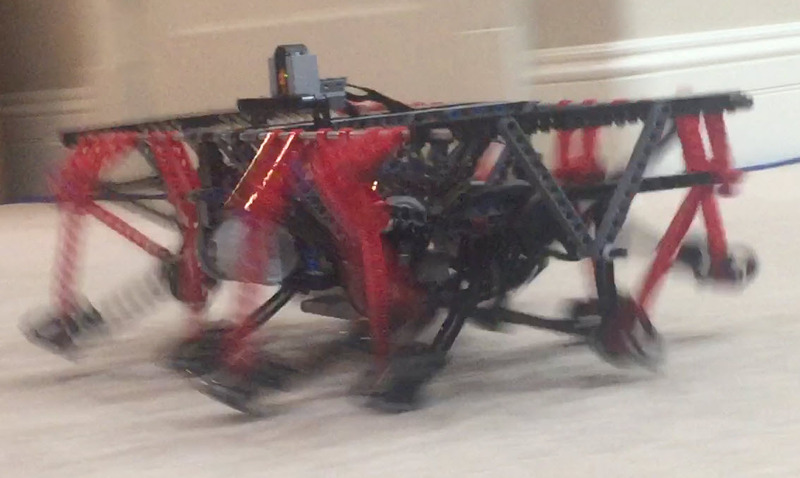 ​Below tests Strider Ver 3 in an 8-leg implementation with longer toes of length 3, as well as a short "heel" of length 1, using LEGO's faster medium motors geared down by 5:1. We added longer toes to reduce how far the robot falls when transitioning from one foot to the next when implemented with only 8 legs. The "heel" makes the gait a bit bumpier however, so we also made a heel-less version in the video at the bottom of this page. Below is a version without "heels", and toes of length 3. With only 8 legs the gait is still bumpy, but it's a little smoother than the version with the heel.